When you need quiet! Start working more efficiently without that obnoxious server sound. Order a UCoustic™ or AcoustiQuiet™ quiet server rack for maximum sound reduction and heat dissipation. These soundproof quiet server racks and cabinets turn the loudest of servers to a faint whisper. Soundproof server racks utilize patented systems and acoustic foam to reduce noise, without overheating equipment. 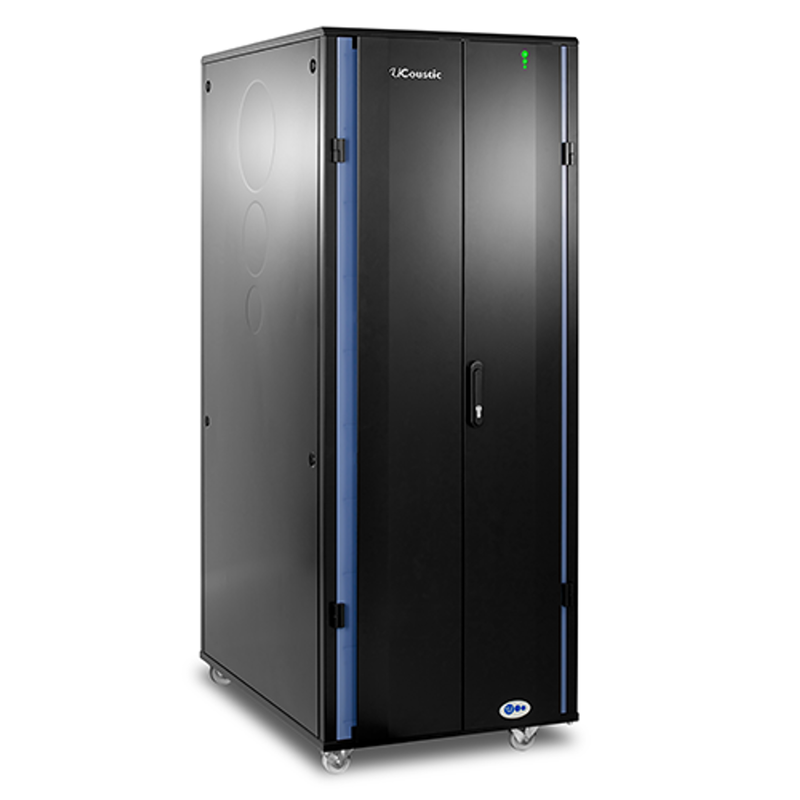 Learn how these quiet server cabinets are an excellent return on investment! Need a recommendation on a soundproof cabinet? Simply fill out the form here and we'll prepare a few options that fit your exact needs. "The Rackmount Solutions cabinet is cheaper, dissipates more heat, and suppresses more sound." - Chuck D.
"I have no hesitation recommending UCoustic Soundproof Server Cabinets to any of my clients." - Dennis L.
"I will offer to show anybody the UCoustic server rack, and let it speak for itself." - Bill W.
This is the only commercially available Network / IT cabinet in the world to provide 31 dB(A) sound reduction and 12KW heat dissipation while utilizing full rack space. Available in Active and Passive models, this server rack provides serious quiet. Made of heavy duty steel, includes casters. Now intelligent! Soundproof wall mount cabinet version of the popular Ucoustic 9210 quiet server rack. This unit removes up to 15dB(A) of noise and up to 1.6kW of heat from loud IT equipment. Great for offices, closets, classrooms, and other areas where dedicated space is limited. Extremely popular as a smaller solution for loud servers. These smaller soundproof server racks and cabinets feature plexi front door and solid rear door with (3) 4.5" quiet fans. Dissipates up to 14dB(A) of noise and 1.5KW of heat. Fits in tight spaces such as under a desk, in a conference or training room. What Difference Can a Soundproof Server Cabinet Make?